For other uses, see Danse Macabre (disambiguation). "Dance of Death" redirects here. For other uses, see Dance of Death (disambiguation). 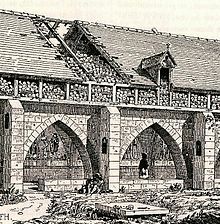 Charnel house at Holy Innocents' Cemetery, Paris. The mural of a Danse Macabre is visible at the wall. The earliest recorded visual example is the lost mural on the south wall of the cemetery of the Holy Innocents in Paris, which was painted in 1424-25 during the regency of John, Duke of Bedford: with its emphatic inclusion of a dead crowned king at a time when France did not have a crowned king, the mural may well have had a political subtext. There were also painted schemes in Basel (the earliest dating from c.1440); a series of paintings on canvas by Bernt Notke, in Lübeck (1463); the initial fragment of the original Bernt Notke painting (accomplished at the end of the 15th century) in the St Nicholas' Church, Tallinn, Estonia (Danse Macabre); the painting at the back wall of the chapel of Sv. Marija na Škrilinama in the Istrian town of Beram (1471), painted by Vincent of Kastav; the painting in the Holy Trinity Church, Hrastovlje, Istria by John of Kastav (1490). A notable example was painted on the cemetery walls of the Dominican Abbey in Bern by Niklaus Manuel Deutsch in 1516/7. This work was destroyed when the wall was torn down in 1660, but a 1649 copy by Albrecht Kauw is extant. 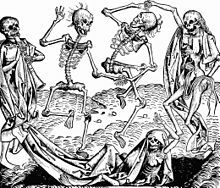 There was also a Dance of Death painted around 1430 and displayed on the walls of Pardon Churchyard at Old St Paul's Cathedral, London, with texts by John Lydgate, known as the 'Dauce of (St) Poulys', which was destroyed in 1549. The deathly horrors of the 14th century such as recurring famines, the Hundred Years' War in France, and, most of all, the Black Death, were culturally assimilated throughout Europe. The omnipresent possibility of sudden and painful death increased the religious desire for penance, but it also evoked a hysterical desire for amusement while still possible; a last dance as cold comfort. The danse macabre combines both desires: in many ways similar to the mediaeval mystery plays, the dance-with-death allegory was originally a didactic dialogue poem to remind people of the inevitability of death and to advise them strongly to be prepared at all times for death (see memento mori and Ars moriendi). Short verse dialogues between Death and each of its victims, which could have been performed as plays, can be found in the direct aftermath of the Black Death in Germany and in Spain (where it was known as the Totentanz and la Danza de la Muerte, respectively). The French term danse macabre may derive from the Latin Chorea Machabæorum, literally "dance of the Maccabees." In 2 Maccabees, a deuterocanonical book of the Bible, the grim martyrdom of a mother and her seven sons is described and was a well-known mediaeval subject. It is possible that the Maccabean Martyrs were commemorated in some early French plays or that people just associated the book's vivid descriptions of the martyrdom with the interaction between Death and its prey. An alternative explanation is that the term entered France via Spain, the Arabic: مقابر‎, maqabir (cemetery) being the root of the word. Both the dialogues and the evolving paintings were ostensive penitential lessons that even illiterate people (who were the overwhelming majority) could understand. Danse macabre in St Maria in Bienno. Frescoes and murals dealing with death had a long tradition and were widespread, e.g. the legend of the Three Living and the Three Dead: on a ride or hunt, three young gentlemen meet three cadavers (sometimes described as their ancestors) who warn them, Quod fuimus, estis; quod sumus, vos eritis (What we were, you are; what we are, you will be). Numerous mural versions of that legend from the 13th century onwards have survived (for instance, in the Hospital Church of Wismar or the residential Longthorpe Tower outside Peterborough). Since they showed pictorial sequences of men and corpses covered with shrouds, those paintings are sometimes regarded as cultural precursors of the new genre. A danse macabre painting may show a round dance headed by Death or a chain of alternating dead and live dancers. From the highest ranks of the mediaeval hierarchy (usually pope and emperor) descending to its lowest (beggar, peasant, and child), each mortal's hand is taken by a skeleton or an extremely decayed body. The famous Totentanz by Bernt Notke in St. Mary's Church, Lübeck (destroyed during the Allied bombing of Lübeck in World War II), presented the dead dancers as very lively and agile, making the impression that they were actually dancing, whereas their living dancing partners looked clumsy and passive. The apparent class distinction in almost all of these paintings is completely neutralized by Death as the ultimate equalizer, so that a sociocritical element is subtly inherent to the whole genre. The Totentanz of Metnitz, for example, shows how a pope crowned with his mitre is being led into Hell by the dancing Death. Bernt Notke: Surmatants (Totentanz) in St. Nicholas' Church, Tallinn. Example of a woodcut from the book. Allegory, satire, woodcuts and death. The famous designs by Hans Holbein the Younger (1497–1543) for his Dance of Death series were drawn in 1526 while he was in Basel. They were cut in wood by the accomplished Formschneider (block cutter) Hans Lützelburger. William Ivins (quoting W.J. Linton) writes of Lützelburger's work: "'Nothing indeed, by knife or by graver, is of higher quality than this man's doing,' for by common acclaim the originals are technically the most marvelous woodcuts ever made." These woodcuts soon appeared in proofs with titles in German. The first book edition, containing forty-one woodcuts, was published at Lyons by the Treschsel brothers in 1538. The popularity of the work and the currency of its message are underscored by the fact that there were eleven editions before 1562 and over the sixteenth century perhaps as many as a hundred unauthorized editions and imitations. Ten further designs were added in later editions. The Dance of Death (1523–26) refashions the late-medieval allegory of the danse macabre as a reformist satire, and one can see the beginnings of a gradual shift from traditional to reformed religion. That shift had many permutations however, and in a thoroughly detailed study Natalie Zemon Davis has shown that the contemporary reception and afterlife of Holbein's designs lent themselves to neither purely Catholic or Protestant doctrine, but could be outfitted with different surrounding prefaces and sermons as printers and writers of different political and religious leanings took them up. Most importantly, it was "The pictures and the Bible quotations above them were the main attractions ... Both Catholics and Protestants wished, through the pictures, to turn men's thoughts to a Christian preparation for death.". The 1538 edition which contained Latin quotations from the Bible above Holbein's designs, and a French quatrain below composed by Gilles Corrozet, actually did not credit Holbein as the artist. It bore the title: Les simulachres & / HISTORIEES FACES / DE LA MORT, AUTANT ELE/gammēt pourtraictes, que artifi/ciellement imaginées. / A Lyon. / Soubz l'escu de COLOIGNE. / M.D. XXXVIII. ("Images and Illustrated facets of Death, as elegantly depicted as they are artfully conceived.") These images and workings of death as captured in the phrase "historiees faces" of the title "are the particular exemplification of the way death works, the individual scenes in which the lessons of mortality are brought home to people of every station." In his preface to the work Jean de Vauzèle, the Prior of Montrosier, addresses Jehanne de Tourzelle, the Abbess of the Convent at St. Peter at Lyons, and names Holbein's attempts to capture the ever-present, but never directly seen, abstract images of death "simulachres." He writes: "... simulachres les dis ie vrayement, pour ce que simulachre vient de simuler, & faindre ce que n'est point." ("Simulachre they are most correctly called, for simulachre derives from the verb to simulate and to feign that which is not really there.") He next employs a trope from the memento mori (remember we all must die) tradition and a metaphor from printing which well captures the undertakings of Death, the artist, and the printed book before us in which these simulachres of death barge in on the living: "Et pourtant qu'on n'a peu trouver chose plus approchante a la similitude de Mort, que la personne morte, on d'icelle effigie simulachres, & faces de Mort, pour en nos pensees imprimer la memoire de Mort plus au vis, que ne pourroient toutes les rhetoriques descriptiones de orateurs." ("And yet we cannot discover any one thing more near the likeness of Death than the dead themselves, whence come these simulated effigies and images of Death's affairs, which imprint the memory of Death with more force than all the rhetorical descriptions of the orators ever could."). Holbein's series shows the figure of "Death" in many disguises, confronting individuals from all walks of life. None escape Death's skeletal clutches, not even the pious. As Davis writes, "Holbein's pictures are independent dramas in which Death comes upon his victim in the midst of the latter's own surroundings and activities. This is perhaps nowhere more strikingly captured than in the wonderful blocks showing the plowman earning his bread by the sweat of his brow only to have his horses speed him to his end by Death. The Latin from the 1549 Italian edition pictured here reads: "In sudore vultus tui, vesceris pane tuo." ("Through the sweat of thy brow you shall eat your bread"), quoting Genesis 3.19. The Italian verses below translate: ("Miserable in the sweat of your brow,/ It is necessary that you acquire the bread you need eat,/ But, may it not displease you to come with me,/ If you are desirous of rest."). Or there is the nice balance in composition Holbein achieves between the heavy-laden traveling salesman insisting that he must still go to market while Death tugs at his sleeve to put down his wares once and for all: "Venite ad me, qui onerati estis." ("Come to me, all ye who [labor and] are heavy laden"), quoting Matthew 11.28. The Italian here translates: ("Come with me, wretch, who are weighed down,/ Since I am the dame who rules the whole world:/ Come and hear my advice,/ Because I wish to lighten you of this load."). Totentanz. Paraphrase on "Dies irae." by Franz Liszt, 1849, a set of variations based on the plainsong melody "Dies Irae". The motif Death and the Maiden, is related to, and may have been derived from, the Danse Macabre. It has received numerous treatments in various media—most prominently Schubert's quartet of that name. Further developments of the Danse Macabre motif include Death and the King's Horseman, "Death and the Senator", "Death and the Compass", and Death and the Physician. ^ "Dance of Death". Catholic Encyclopedia. 2007-02-20. ^ See External links to access to this work, including English translation, online. ^ As reproduced in Gundersheimer, 1971. p.5. Register Aiii of original. ^ Simolachri, Historie, e Figure de la Morte. In Lyone Appresso. Giovan Frellone, M.D. XLIX. Bätschmann, Oskar, & Pascal Griener (1997), Hans Holbein. London: Reaktion Books. Israil Bercovici (1998) O sută de ani de teatru evriesc în România ("One hundred years of Yiddish/Jewish theater in Romania"), 2nd Romanian-language edition, revised and augmented by Constantin Măciucă. Editura Integral (an imprint of Editurile Universala), Bucharest. ISBN 973-98272-2-5. James M. Clark (1947), The Dance of Death by Hans Holbein, London. James M. Clark (1950) The Dance of Death in the Middle Ages and Renaissance. André Corvisier (1998) Les danses macabres, Presses Universitaires de France. ISBN 2-13-049495-1. Natalie Zemon Davis (1956), "Holbein's Pictures of Death and the Reformation at Lyons," Studies in the Renaissance, vol. 3 (1956), pp. 97–130. Werner L. Gundersheimer (1971), The Dance of Death by Hans Holbein the Younger: A Complete Facsimile of the Original 1538 Edition of Les simulachres et histoirees faces de la Mort. New york: Dover Publications, Inc.
William M. Ivins Jr. (1919), "Hans Holbein's Dance of Death," The Metropolitan Museum of Art Bulletin, vol. 14, no. 11 (Nov., 1919). pp. 231–235. Landau, David, & Peter Parshall (1996), The Renaissance Print, New Haven (CT): Yale, 1996. Sophie Oosterwijk (2008), 'Of dead kings, dukes and constables. The historical context of the Danse Macabre in late-medieval Paris', Journal of the British Archaeological Association, 161, 131-62. Sophie Oosterwijk and Stefanie Knoell (2011), Mixed Metaphors. The Danse Macabre in Medieval and Early Modern Europe, Newcastle upon Tyne: Cambridge Scholars Publishing. ISBN 978-1-4438-2900-7. Meinolf Schumacher (2001), "Ein Kranz für den Tanz und ein Strich durch die Rechnung. Zu Oswald von Wolkenstein 'Ich spür ain tier' (Kl 6)", Beiträge zur Geschichte der deutschen Sprache und Literatur, vol. 123 (2001), pp. 253–273. Ann Tukey Harrison (1994), with a chapter by Sandra L. Hindman, The Danse Macabre of Women: Ms.fr. 995 of the Bibliothèque Nationale, Kent State University Press. ISBN 0-87338-473-3. Wilson, Derek (2006) Hans Holbein: Portrait of an Unknown Man. London: Pimlico, Revised Edition. Henri Stegemeier (1939) The Dance of Death in Folksong, with an Introduction on the History of the Dance of Death. University of Chicago. Henri Stegemeier (1949) Goethe and the "Totentanz" The Journal of English and Germanic Philology 48:4 Goethe Bicentennial Issue 1749-1949. 48:4, 582-587. Hans Georg Wehrens (2012) Der Totentanz im alemannischen Sprachraum. "Muos ich doch dran - und weis nit wan". Schnell & Steiner, Regensburg ISBN 978-3-7954-2563-0. Sophie Oosterwijk (2004), 'Of corpses, constables and kings: the Danse Macabre in late-medieval and renaissance culture', The Journal of the British Archaeological Association, 157, 61-90. Sophie Oosterwijk (2006), '"Muoz ich tanzen und kan nit gân?" Death and the infant in the medieval Danse Macabre', Word & Image, 22:2, 146-64. Sophie Oosterwijk and Stefanie Knoell (2011), Mixed Metaphors. The Danse Macabre in Medieval and Early Modern Europe. Newcastle upon Tyne: Cambridge Scholars Publishing. ISBN 978-1-4438-2900-7. Marek Żukow-Karczewski (1989), "Taniec śmierci (Dance macabre"), Życie Literackie (Literary Life - literary review magazine), 43, 4. Wikimedia Commons has media related to Danse Macabre. Les simulachres & historiees faces de la mort: commonly called "The dance of death'' - 1869 photographic reproduction of original by Holbein Society with woodcuts, plus English translations and a biography of Holbein. Sophie Oosterwijk (2009), '"Fro Paris to Inglond"? The danse macabre in text and image in late-medieval England', Doctoral thesis Leiden University available online. Images of Danse Macabre (2001) Conceptual performance by Antonia Svobodová and Mirek Vodrážka in Čajovna Pod Stromem Čajovým in Prague 22 May 2001'. This page was last edited on 10 April 2019, at 14:06 (UTC).